After the destruction of Jerusalem in AD 70, the Romans added insult to injury by turning the Temple Tax into the Jewish Tax (the infamous fiscus Judaicus). The half-shekel that was originally offered to the Lord’s sanctuary (Exodus 30:13) was now being sent to Jupiter’s temple in Rome. Jews were required to pay this tax on top of all the regular Roman taxes. Christians believe in paying their taxes, but this doesn’t mean they like where the money is going. They have long objected to federal funding of abortions, and the idea of using tax money to support “spouses” of homosexual public employees seems no less odious. In my view, tax-supported funding of materialistic science comes closer than anything else to a kind of fiscus Christianus. Following the triumph of Darwinism in the late 19th and early 20th centuries, major universities, museums, and research institutes succeeded in marginalizing people of faith. Striking evidence of this coup shows up in the ranks of the National Academy of Sciences. According to one poll conducted in the late 1990s, only 7% of NAS members profess a “personal belief” in God. "Render therefore unto Darwin the things are Darwin's." 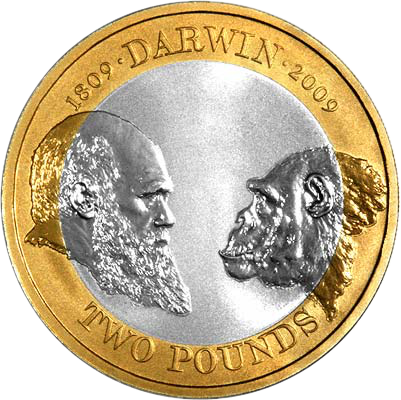 The Royal Mint of Britain issued a two-pound coin in 2009 to celebrate the bicentennial of Charles Darwin's birth. Meanwhile, the dissidents are suppressed at every turn. Caroline Crocker earned her Ph.D. in immunopharmacology and had an outstanding teaching reputation before losing her job at George Mason University. Her plight was featured in the movie Expelled: No Intelligence Allowed, but this is just the tip of the proverbial iceberg. There are countless unpublicized stories of discrimination against Darwin dissenters and religious conservatives. Being hounded out of a job is only part of the story. Billions of tax dollars are committed every year to support Big Bang cosmology, evolutionary biology, and other pursuits of materialistic science. Christians have been asked through their tax dollars to fund missions to Mars because it is inconceivable that life could have evolved only on Earth. Ditto for funding of SETI (Search for Extraterrestrial Intelligence). They have been asked to fund museum exhibits that portray the story of human evolution. They have been asked to fund large-scale physics experiments that promise to tell us how something could have come from nothing. In other words, the very same people who are obligated by God to pay their taxes are the very same people who are expected to fund the Temple of Darwin’s outreach efforts. Thankfully, the Darwinian-industrial complex doesn’t always get what it asks for. The Superconducting Super Collider was supposed to find the Higgs boson – what Leon Lederman dubbed the “God particle” in his 1993 book of the same name. It was cancelled when cost projections climbed to the $12 billion mark, but only after researchers spent two billion dollars on a boondoggle now littering the Texas countryside. Meanwhile, students seeking relief from the materialist worldview and its sordid consequences must pay a premium to attend a private, church-affiliated school. If they choose instead to attend a public university they will feel decidedly unwelcome in a variety of subject areas, and will have their views silenced by campus-wide speech codes. So although there is no fiscus Christianus as such, at least not officially, Christians are still being made to support a system that is institutionally opposed to their faith. Many Christians call or write their representatives when moral issues are at stake: abortion, homosexual “marriage,” or what have you. But how many write to object to the funding of materialistic science? How many have looked into the cost of these projects? How many have wondered whether their favorite public university supports the First Amendment? Maybe it’s time to start. Menachem Elon, “Taxation: Legal Aspects,” Encyclopaedia Judaica, 2007, 19:535. Albert C. Brooks, Who Really Cares: The Surprising Truth about Compassionate Conservatism. New York: Basic Books, 2006, p. 38. Edward J. Larson and Larry Witham, “Leading Scientists Still Reject God,” Nature, 1998, 394:313. Eugene Volokh, Brief of FIRE and NAS as Amicus Curiae in support of Keeton v. Anderson-Wiley, et al., October 19, 2010. The Foundation for Individual Rights in Education keeps a database of speech restrictions at http://thefire.org/. The issue of origins is in the news once again. No matter what side you’re on, it goes to the very heart of what we are as human beings, and what we believe is ultimately real. Many Americans have a take-it-or-leave-it approach to prayer, but an overwhelming majority of Americans (around ninety percent) believe in a higher being of some kind.